We common say that: only ‘change’ is constant. However you know as much as I do how difficult it is to cope with change. More importantly to get your colleagues to change to live up with the ever-changing environment is the greatest challenge of most entrepreneurs and managers. 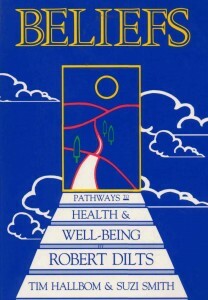 Reading the book written ‘BELIEFS Pathways to health & wellbeing’ by Robert Dilts & two of my NLP tutors: Tim & Suzi help me much to understand the concept of ‘change’ and gave me some practical tools to achieve ‘changes’ in me and others. I have since an e-copy of the book and would be glad to share it with you. Read below an extract of the introduction to the book. You might be interested to know that Robert Dilts cured her mother’s breast cancer, which had reached a degree of metastasis, by changing her beliefs. Would you now invest some time to document yourself on the power of ‘Change’? My sincere wish is to make know this method of ‘BELIEFS CHANGE’ to attempt to alleviate the pains of the drug addicted population of our nation. Change is a multilevel process . . .
Changes in our relationship to those things which are bigger than us, those things that most people would call the spiritual. This book is about gaining more choices at a particular level of change—the level of beliefs. The purpose of this book is to provide conceptual and interactive tools necessary to understand and gain more choices within the belief systems that guide our behavior in the world around us. change involved in making complete and lasting behavioural change. beliefs was being presented and dealt with as an advanced level skill. to the questions and answers, and participating in the discussions and exercises. your own beliefs about the possibilities and methods involved in the process of lasting change, as opposed to a simple description of techniques or procedures. It is through NLP, a cognitive behavioural science that I became very interested with learning. Was it a return to an old project? Deep inside myself I had some inner wish to become teacher. I recalled whilst I was in my early adult hood, I spent some time seriously considering a career in teaching. I dropped the idea after some time. Yet my urge for teaching has not subsided. Much later in my career, circumstances prompted me to exercise my talents as a facilitator/ teacher. After my training with the Covey Leadership Center to become a certified Covey trainer and the advent of the IVTB program encouraging businesses to train employees, I found a niche. Looking back to the numerous Covey seminars I facilitated, I could only rejoice. I had hopefully help out a number of persons and arouse in them the need to continuous learning. The world of learning is taking forms that never before were imaged. Teaching should not be the focus. Learning is the centre piece. And now with WEB 2.0, we are in the realm of Social Learning. Albert Bandura is a Canadian born most cited psychologists behind Freud, Piaget, and Eysenck and is still living. Bandura believed in “reciprocal determinism”, that is, the world and a person’s behavior cause each other, while behaviorism essentially states that one’s environment causes one’s behavior, Bandura, who was studying adolescent aggression, found this too simplistic, and so in addition he suggested that behavior causes environment as well. Later, Bandura soon considered personality as an interaction between three components: the environment, behavior, and one’s psychological processes (one’s ability to entertain images in minds and language). Social learning theory has sometimes been called a bridge between behaviorist and cognitive learning theories because it encompasses attention, memory, and motivation. The theory is related to Vygotsky’s social development theory and Lave’s learning theories, which also emphasize the importance of social learning. Last night, I spent two hours listening to the recordings I took during the eye opening seminar I attended by a Philosopher. The material was so dense that I had to stop the recording on and off to reflect thereon. I then mentally reassess my position in the light of Bertrand Vergely point of view. By so doing, I found that by using an ‘observer’ perceptual position, I could better judge the position to take, in melting some of the good sense that Bertrand Vergely was driving to some of my own convictions. I totally adhere to the thesis of Bertrand Vergely on Primary Intelligence (reptilian) and Creative Intelligence which was for me a new way of defining the type of intelligence. Today whilst reading, an article of coaching it was suggested that one could be one’s own coach by imagination and the use of our creative intelligence. In NLP, we call this the ‘what if’ frame. This is at least how Marshall Goldsmith & Patricia Wheeler start off their script on Coaching. First, take a deep breath. Now, imagine that you are 95 years old and about to die. Before you take your last breath, you are given a wonderful, beautiful gift: the ability to travel back in time and talk with the person you are today. The 95-year-old you has the chance to help the you of today to have a great career and a great life. The 95-year-old you knows what was really important and what wasn’t; what really mattered and what didn’t; what really counted and what didn’t count at all. What advice does the wise “old you” have for you? Take your time. Jot down the answers on two levels: personal advice and professional advice. And once you write down these words, take them to heart. In a world of performance appraisals, this may well be the one that matters most. At the end of life, if the old you thinks that you did the right thing, you probably did. If the old you thinks that you screwed up, you probably did. At the end of life, you don’t have to impress anyone else—just the person you see in the mirror. 2. Look to the present. The great disease of “I will be happy when…” is sweeping the world. You know the symptoms. You start thinking: I’ll be happy when I get that . . . BMW . . . promotion . . . status . . . money. The only way to cure the disease is to find happiness and meaning now. 3. Don’t get so lost in pleasing the people who don’t care that you neglect the people who do—your friends and family. You may work for a wonderful company and believe that your contribution is important. But when you’re 95 and on your death bed, very few of your fellow employees will be waving goodbye! Your friends and family will likely be the only people who care. To make a new beginning in life or in your leadership, look ahead to the end and then decide what to do. Why do some people reach their creative potential early while equally talented peers don’t? We’ve all seen the near-misses: people who have talent to spare but never quite make it; and those, like the tortoise in Aesop’s fable, who enjoy eventual success that once seemed out of reach to most observers. If you believe you are born with all the smarts and gifts you’ll ever have, you tend to approach life with a fixed mind-set. However, those who believe that their abilities can expand over time live with a growth mind-set—and they’re much more innovative. As coaches, we encounter people who have a stellar track record, off-the-chart IQ, great technical expertise, and a track history of success—but who then reach a career plateau. In contrast, we work with individuals who, despite a rather pedestrian early track record, lack of Ivy League pedigree, surpass those who appear to be the “chosen ones.” How does this happen—and what can you do about it? This is good news for those who do not grow up feeling chosen or special. Feeling much more like the tortoise than the hare, you may stumble along while others seem to sail through life easily and successfully—or so it seems. In reality, the pampered and pedigreed are often the ones who stumble, due to adopting a fixed mindset. We’ve all seen folks who were tapped as stars early in life. Cheered on by doting, praise-lavishing parents, they develop the sense that their talents are God-given qualities that they can count on for future success. What’s the problem with this? They feel entitled to succeed and become risk-avoidant, fearing the embarrassment of failure. They deal with obstacles by giving up, feigning disinterest or blaming others. Or, having enjoyed so many early wins, they keep on doing what made them successful, despite all the changes around them—not a great recipe for ongoing success. Mark was a bright, results-oriented VP in his company and yet he offended his peers with his brusque style and impatience. His manager doubted that he could, or would, change. And Mark had no patience with fluff. He needed a clear business case for making any behavior change. Once he understood that listening more and increasing his patience would lead to better buy-in from others and improve his department’s product, he embraced the change enthusiastically. Mark implemented his development plan diligently with great results—to the astonishment of his manager. What propelled Mark’s progress? He embraced a mindset of growth. Never a natural star or charismatic presence, he’s a regular guy who approached challenges with curiosity and saw roadblocks as signs that he needed to change strategy, increase effort, stretch himself, or try new behaviors (high emotional intelligence). In our early meetings, Mark took a learner’s approach to his 360-degree feedback. Although surprised with the negatives, he didn’t deflect or blame his stakeholders. Although a very private man, he faced his fear of disclosing more about himself to others to enhance his leadership. In other words, he embraced the possible. You can adopt an attitude that enables you to grow and change. First, listen to yourself—to the internal music and lyrics that you hear inside your head? Are you telling yourself to give up? That your challenges are the fault of others, less wonderful, less “enlightened” people? Or do you tell yourself that you can figure out what abilities you need to grow or stretch toward to succeed? These belief systems are the underpinning of the success—and failure—of many. Second, create a regular time and space to reflect on who you are—your beliefs, your vision, your inner dialogue. This will be unfamiliar and uncomfortable for those who value speed and are used to a track record of stardom. My advice: do it anyway. Third, find a partner to serve as “spotter” and dialogue partner as you grow. This could be a trusted colleague or an experienced executive coach. They’ll help you leverage your strengths and stay out of the way of your blind spots. Recently, Mark described how he now observed patterns in meetings. “Now that I know myself better,” he said, “I see how other people use different behaviors to manage stress. I’m less impatient with them because I know what they’re trying to do, and I don’t let it get to me.” In fact, Mark now uses his new knowledge in developing and mentoring others. His department is delivering results more effectively, and other leaders are asking him and his team to participate in highly visible and strategic projects. So what started out as a simple self-improvement project by an ordinary guy has turned into a big win for his company—largely because he has a mindset of growth.